What is Fire Diving? That is a good question.. Fire Diving is the "hottest" new. Extreme Sport around. Fire diving is when ateam of Scuba or Skin Divers compete with another team on how many divers they can have scooped up by either a helicopterbucket or the scoop of a water dropping airplane. 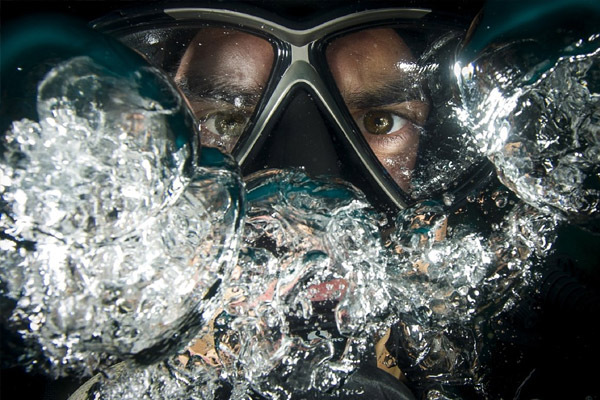 The divers generally wear camouflaged NOMEX wet suits and wait just under the water for the approaching aircraft. As the plane is scooping or the helicopter is dipping we swim as fast as we can to get in the path of the aircraft in order to be scooped up. The pilots don't like scooping up divers, so they try to avoid it. We divers have had to develop techniques to make sure they can't tell where we are on their downwind leg. Staying underwater doesn't work because you can't see where the water bombers or helicopters are. We have to stay on the surface so we can watch them coming in. When they turn onto final, we have to swim like crazy to get into the aircraft's path so we can be picked up. Helicopter scoops are very tricky. Rotor downwash causes a vortex around the "Bambi" bucket which makes it very difficult to hold on during the drop. The pilots have an excellent view which demands very tactful bucket entry. 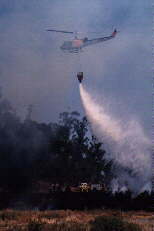 This is also the reason why the Chopper league performs so well in the fixed wing water bomber competitions. Many divers have painted their tanks and most of their equipment with a crazy pattern of green, gray, pink, blue, and brown hexagons. I know it sounds weird but many of Fire Divers believe this camouflage pattern is the best there is. Where is Fire Diving ? While many fire diving teams practice on a regular basis, there are very few scheduled fire diving competitions. Most Fire Divers have Police scanners to monitor major fires and watch the news for major fires in their area. As you might expect the LA and Malibu Canyon have very active Fire Diving teams. In northern Canada there are lots of lakes that are dead from acid rain. There's not much to see in them, but during the forest fire season, the ones near the fires get dived constantly. Why? SCUBA divers hitching rides, that's why. It is not usually talk about because the opportunities are limited and there's already a lot of competition fopr rides. Elgurp Helgelpikkl is the current record holder with an astounding 17 rides over the Wassdasukken Sound outbreak, Labrador, summer of '93, 2700 hectares. In this case, they were actually scooping, making the record that much more unbelievable. Many of the BCD manufactures have parachute options. The Zeagle BCD's and the Seaquest Quickdraw both have an optional left hand rip cord release for the parachute option (the right hand ripcord is for the weights). Many Fire Divers use a horse collar style BCD so they can have the space in back for a parachute. The current trend for many Fire Divers is to quickly fasten a bungie cord to the aircraft and make a round trip. This is considered cheating in many leagues because some divers try to count this as a second scoop. Veteran Fire Divers simply inflate their BCD's on the way down to fall slower than the water and then land in the water from the scoop, proper weighting is VERY important in Fire Diving. While some Fire Divers prefer to use dive skins or 3mm suits for streamlining themselves, most of the newer fire divers are now using NOMEX wetsuits , diveskins and even the occasional drysuit. The advantage of drysuits is that the suit can be inflated on the way down softer landings. We offer a unique, small-boat experience for up to 6 passengers. 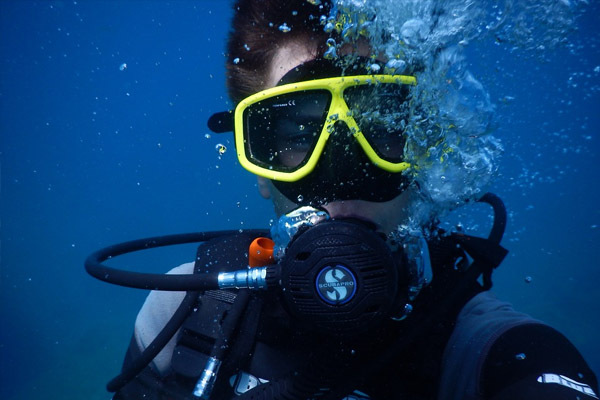 We also offer a full range of scuba instruction courses. The most popular dive we offer is a two-tank, two-location morning dive. 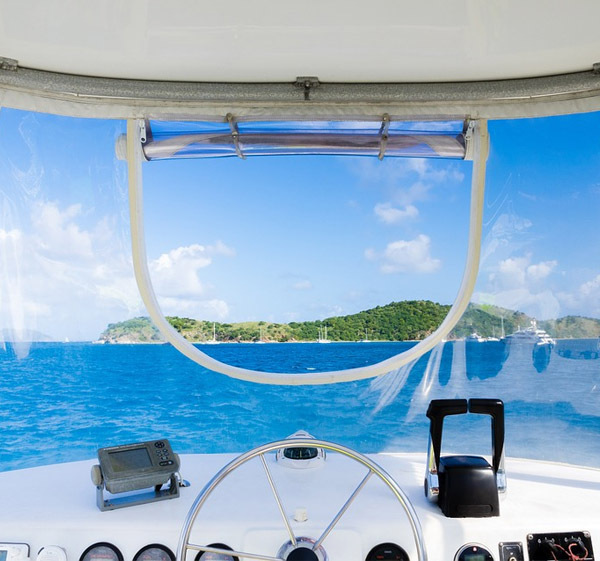 The average boat ride is twenty minutes. The variety of underwater structure in relatively shallow water lends to a typical dive profile in the thirty to sixty foot range. The greatest variety of sea life is in shallow water. The risk of "the bends" is greatly reduced in the "comfort zone." We prefer 60 minutes of bottom time at thirty feet to 15 minutes at ninety feet. 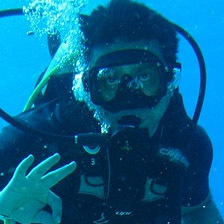 afternoon dives, night dives, and fish/dive charters are always available on request. Capt. Lara is the heart and soul of our team. She is responsible for the day-to-day operations. 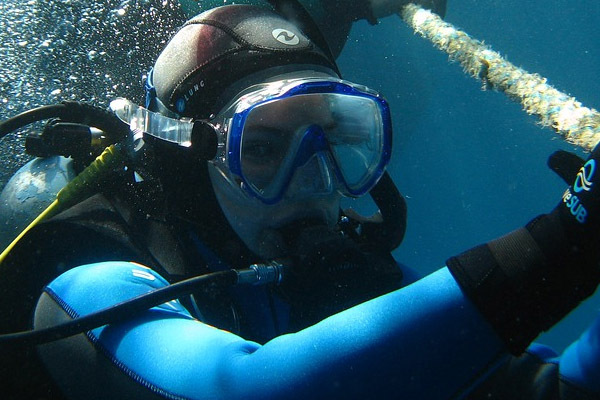 She is an outstanding diver with an uncanny knack for finding unusual sea life. Capt. Steve has been diving the North Coast for more than 15 years, logging tens of thousands of dives. He has a degree in Marine Biology, and is a U.S. Coast Guard-licensed Captain. He is a Master Scuba Diving InstructorA day diving with Luke is sure to be a day you will remember! Diving is a sport that involves vaulting from a springboard or platform, performing an acrobatic move and then landing in water. Diving has become recognized worldwide as a sport and is included in the Summer Olympic Games. Competitive diving requires skill, strength, flexibility and a keen sense of timing, many of the same attributes of dancers and gymnasts. Many divers were gymnasts or dancers before taking up competitive diving. Today diving is an exciting athletic sport that takes skill, grace, strength and courage. To describe it simply, diving a combination of ballet and gymnastics performed over water. 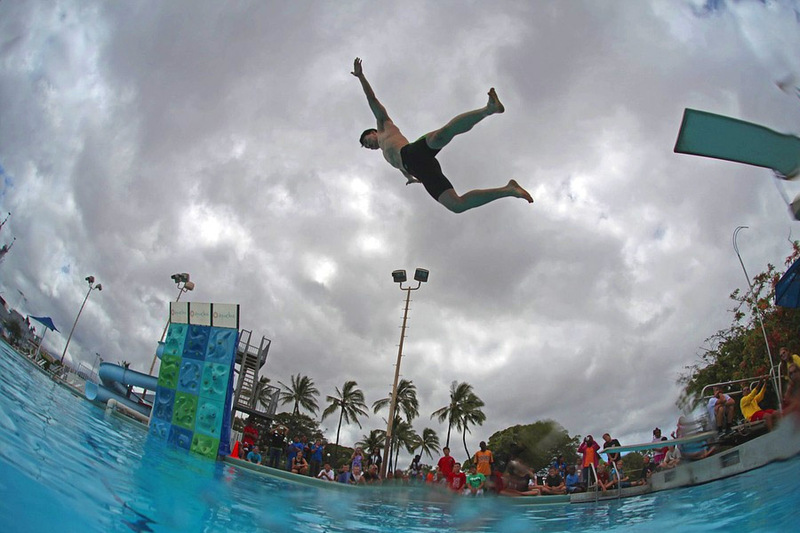 Non-competitive diving has long been a pastime, with most large public swimming pools having at least one dive board. People have been running and leaping off heights into the water below for centuries. You could be easily forgiven if you think a dive is just a dive, but actually there are a great many different dives that can be executed, each one having distinctive elements the others do not possess. For spectators often the dive is over so quickly that it is hard to see what happened before the diver entered the water. Once you have a basic understanding of the different types of swimming dives it will make watching professionals so much more enjoyable.